11 Days. Three days in Oslo, one in Fråm, one in Balestrand, two in Bergen, four days (so far) on the MS Vesterålen. 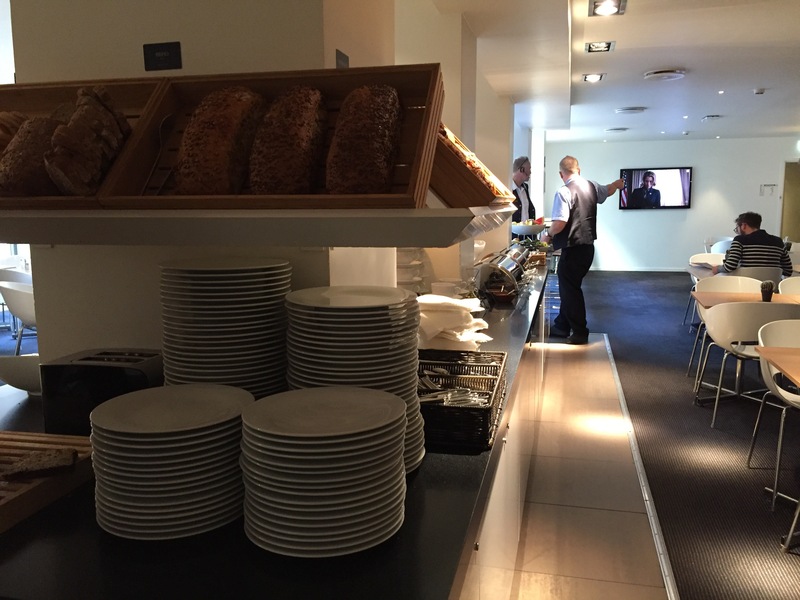 A variety of settings–urban, rural, boat… yet, with Norwegian breakfast comes consistency. When reading up on what to expect before leaving on my trip to Norway a particular phrase came up repeatedly…”traditional Norwegian breakfast”. As in, “expect a traditional Norwegian breakfast”, “a traditional Norwegian breakfast is served”, “a typical traditional Norwegian breakfast is provided”, and so on. The first thing that came to mind, my own Grandmother being Norwegian, was Grandma Lillian standing at the kitchen counter or stove making waffles, pancakes, or Swedish pancakes, accompanied by eggs, bacon or sausage, and maybe some cantaloupe. Well, only one of these happens to be a part of a “traditional Norwegian breakfast”. Cantaloupe. 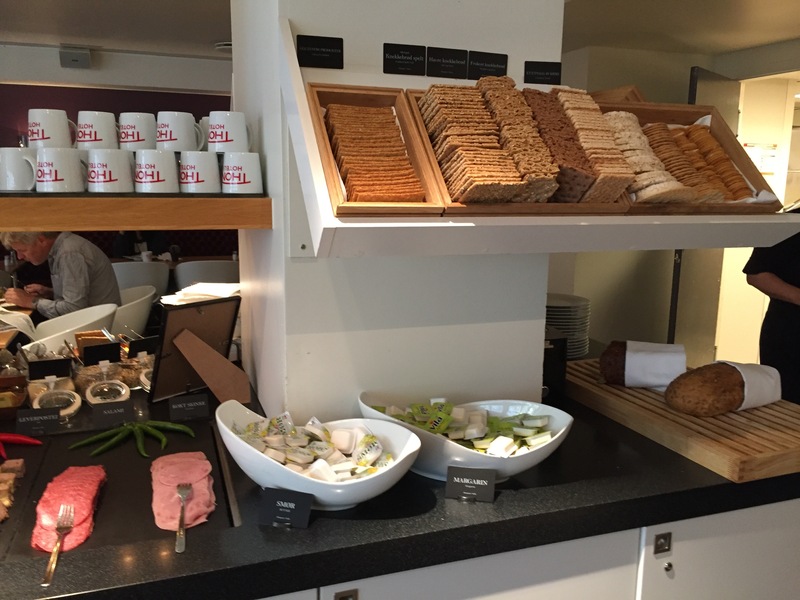 The “traditional Norwegian breakfast”, for travelers anyway, is simple and varied. There are a variety of whole grain, seedy breads, knekkebrod (crisp bread), and crackers. The bread is not intended to be toasted, rather it’s purpose is to be topped–open sandwich style, picking it up to be eaten carefully, or when topped with multiple toppings most often eaten with fork and knife. The combination of toppings for your bread is only limited by your imagination and number of toppings. Possible toppings offered include meats. A variety of pickled herring…in tomato sauce, in mustard sauce, and just plain pickled (with onion, course). Cold shrimp. Thinly sliced cold meats, primarily ham, lamb, and salami, sausage (cold), smoked salmon (laks). Cheeses…Jarlsberg, brunost (brown sweet cheese), nokkelost (flavored with cumin and caraway seeds and cloves), and soft goat cheese are the most typical. There are typically scrambled or soft boiled eggs–intended for your bread as well. A variety of vegetables are included in your traditional Norwegian breakfast spread. Lettuce, sliced tomato, sweet peppers, and cucumbers. A wonderful variety of melons have been a mainstay–watermelon, cantaloupe, honeydew, casaba. Spreadables make an appearance as well. Butter. Tube of caviar. Tube of liverwurst. Tub of nuggat (think thicker version of Nutella). A few jams–strawberry, rhubarb, lingonberry. Cereal options also make their appearance. Corn flakes, puffed oats, and muesli along w/ a variety of dried fruit and nuts to be used as toppings, and choice of milk or yogurt. My go to breakfast option so far has been yogurt, nuts, muesli, dried banana and coconut chips/chunks. This has been delicious and extremely filling. The Midtnes Hotel in Balestrand didn’t have yogurt, but they did have a thick cultured milk which was very similar to yogurt. Topping your bread makes other appearances later in the day. Open faced sandwiches at lunch, with many of the morning’s toppings making a second showing. Bread makes a final appearance after dinner as well, before bed–but this time a more simple topping of one or two items. This is known as pålegg.